The Philadelphia Police Department has maintained that Tate-Brown was pulled over by officers because the lights of his 2014 Dodge Charger were not turned on. They say one officer was knocked to the ground in a tussle with Tate-Brown, who was then shot and killed by another officer once he reached into the passenger side of his car for a stolen, loaded handgun. 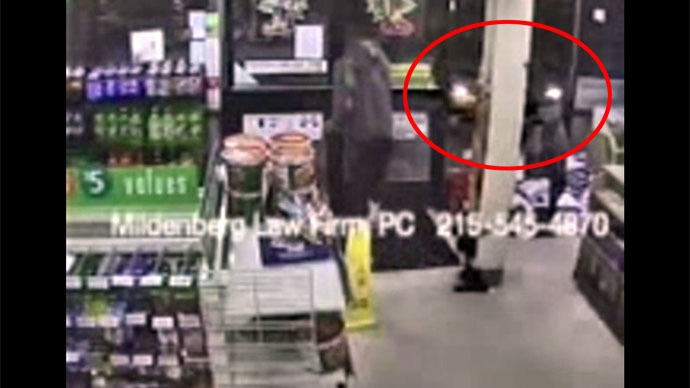 Yet the new footage given to the Philadelphia Daily News by Brian Mildenberg, an attorney for Tate-Brown's mother, Tanya Brown-Dickerson, revealed that Tate-Brown stopped at a 7-Eleven moments before his death. Identified by his mother, Tate-Brown had his car lights on in the footage. "You see clearly that he pulls up in his white car with the headlights on. He gets out, walks into the 7-Eleven, walks around, and then drives off with his lights on the entire time," Mildenberg said. The surveillance footage was accessed by private investigators, Mildenberg said, and made public by the Daily News first on Monday evening. "We know from the video that his headlights were on, and we know that he wasn't reaching for a gun when they shot him," Mildenberg said. "Whether Brandon started the struggle or whether he had a gun is not clear, but we do know [that the Police Department] lied about two items." Mildenberg also told the Daily News last week that surveillance footage accessed by police that he and Brown-Dickerson were invited to watch at the Philadelphia police’s Internal Affairs Division showed that Tate-Brown was not shot next to the passenger side of the car, nor next to a weapon, but from behind the trunk of the car after he fled across a nearby street. "From the video, the moment he was shot, he was running away from the officer, across Frankford Avenue," Mildenberg said. "He was behind his vehicle, near the trunk of the vehicle – not near any doors – when he was shot and dropped down." "He was behind his vehicle, near the trunk of the vehicle - not near any doors - when he was shot and dropped down." The footage they viewed at police offices came from four different cameras set up at nearby businesses, the Daily News reported. The images come from a distance and are murky or indecipherable at times, according to the report. Police Commissioner Charles H. Ramsey said last week that the "quality of the tapes are not very good" and were not relied on completely during the department’s investigation. "The investigation did not rely solely on the tape," he said. "You have the officers' statements, and statements from four independent eyewitnesses who actually observed the incident as it took place." District Attorney Seth Williams is investigating the case locally. Mildenberg and Brown-Dickerson have called for the US Department of Justice to open its own probe into the fatal shooting. They also want the Philadelphia Police Department to publicly release the surveillance footage, in addition to witness statements, police radio communication, and other records of the shooting. "If you're running across Frankford Avenue, obviously that's not complying with the police officer, and we're not saying that's OK," Mildenberg said. "But police aren't licensed to shoot every person that runs from them." Ramsey said he would not release the officers’ statements, nor their names for that matter. He also said the department’s surveillance footage was off limits, and that he apologized to Brown-Dickerson for not notifying her when the officers were allowed back on patrol after being cleared of department violations. "Believe me, I understand the loss of life, and the tragedy that goes along with it, but we also have to be very mindful to let the investigation take place," Ramsey said. "This isn't trial by media, and it's not trial by public opinion. This has to be based on facts." Allowing Brown-Dickerson and Mildenberg to view police footage was part of the department’s efforts at transparency in the case, Ramsey said, after they had requested that of police for two months since the shooting. "We did let them see the tape. That's what was being asked, and we did see to that," Ramsey said. "We have nothing to hide." “This report shows that while the police department has made some improvements in its stop and frisk practices, there are still far too many persons – tens of thousands each year – who are stopped and frisked without legal justification. In our view, the city must move very decisively to ensure that stops are made only where there is reasonable suspicion of criminal conduct. Failing such action, we will seek court intervention to secure full compliance with the consent decree,” said David Rudovsky of Kairys, Rudovsky, Messing & Feinberg, LLP.